SHUR-TRIP traps are uniquely different in their trigger mechanism. Other traps have a treadle plate on the floor of the trap that requires the animal to actually step on it with force before the door is tripped. The problem is many times the animal will either step or reach over the treadle plate and steal the bait without ever stepping on the treadle plate and tripping the door. As a result you may have to bait and set the trap several times before actually trapping the animal. SHUR-TRIP traps have a swinging bait holder that is suspended from the top of the trap. This bait holder pivots forwards and backwards. Simply place your bait in the bait holder and set the trigger. 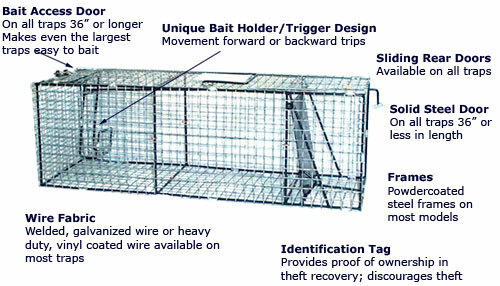 When the animal goes inside the trap and simply attempts to steal the bait, they will move the bait holder either forwards or backwards tripping the door behind them. With this design we have had reports of professional trappers catching even small cats in our large dog traps.